Academy Award-winning actor Nicolas Cage, jailed in New Orleans over an alleged outburst against his wife, police and a few parked cars, is free today after reportedly being bailed out by reality TV star Duane "Dog" Chapman. "I am a truly dedicated fan of Mr. Cage and will not be granting any interviews about my client as I wish to respect his privacy," Chapman, a bail bondsman and bounty hunter who parlayed his colorful personality to land a TV show, "Dog the Bounty Hunter." "I performed my duties as a bail bondsman and not in connection with our show," he said. "This is what I do for a living." According to the New Orleans Police Department, Cage, 47, was "heavily intoxicated and arguing with his wife Alice Kim, 27, in front of a home at 11:30 p.m. Saturday on Dumaine Street in the city's French Quarter, insisting that the house they were in front of was their rental property. Police said that Cage grabbed his wife by her upper arm and dragged her towards the property that he believed they were renting -- there were no visible signs of injury to Kim's arm. The actor then allegedly began to strike cars in the immediate vicinity and attempted to jump into a taxi, police said. At this point a police officer "immediately observed that Cage was heavily intoxicated and ordered him out of the cab, which prompted Cage to start yelling," according to police. Cage allegedly said to the police "Why don't you just arrest me?" gossip website TMZ.com reported. The police did just that, arresting him on one count of domestic abuse and one count of disturbing the peace. TMZ also stated that Kim is not a complaining witness, does not want her husband to be charged and that witnesses have said there was no physical contact between the two. 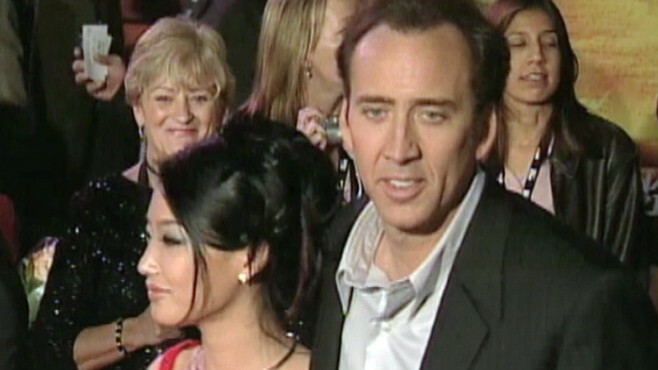 Cage has been married to the former waitress Kim since July 30, 2004. The two had a son, Kal-El, in 2005. The actor has been nominated for an Academy Award twice and won the Oscar for best actor for his portrayal of an alcoholic spiraling out of control in 1995's "Leaving Las Vegas." Born Nicolas Kim Coppola, Cage changed his name to avoid the appearance of nepotism, as he is the nephew of legendary film director Francis Ford Coppola. Cage has previously been married to Patricia Arquette and Lisa Marie Presley. Late last year Nicolas Cage -- who is known to fly off the handle in memorable performances in films such as "Moonstruck" and "Adaptation" -- made the news for his off-screen temper. While leaving a night club in Romania, where he was on location filming the sequel to his 2007 hit "Ghost Rider," the actor was filmed bursting into a rage during an altercation with a companion. Cage was taped screaming: "I thought we were brothers, man," and "I'll die in the name of honor!" TMZ has also previously reported that the actor is facing financial troubles. A federal tax lien from 2009 showed that Cage owes over $6.7 million in taxes for 2008. He's been forced to sell off some of his "national treasure" including a Bavarian castle, and a Rhode Island home sold earlier this month at a $9.5 million loss. "I mean everybody makes mistakes. It's part of being human," Cage said on "Good Morning America" earlier this year. "And when we make mistakes, I think sometimes it can be a great lesson because it puts you in to looking for something. Some people say you have to be a sinner before you can be a saint." Cage made news earlier this week when a missing mint copy of Action Comics No. 1 -- the comic book debut of Superman -- belonging to him surfaced in a San Fernando Valley, Calif., storage locker. The comic, which has been authenticated, was stolen from Cage more than a decade ago, according to Detective Don Hrycyk with the Los Angeles Police Department's Art Theft Detail. Cage accepted an insurance payout after the theft, so it is unclear if he will regain his missing comic.